I have a polish from another new Indie polish brand. This is Graffiti by Sparkles by Julie. 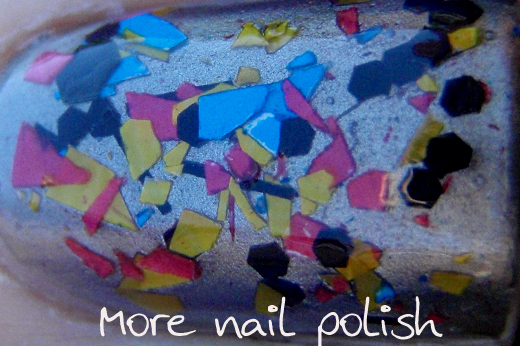 This nail polish contains mainly matte shredded glitters in red, yellow and blue with the addition of black hexes and bars. 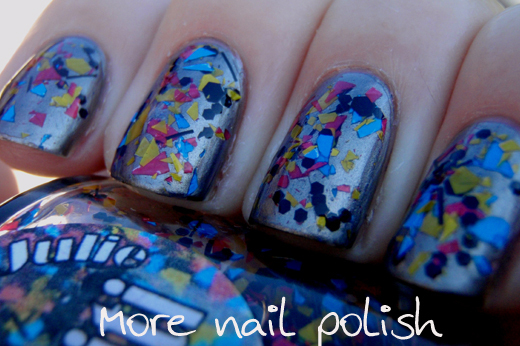 I'll definitely give Julie credit here that this polish sure does look like Graffiti! Because of the black glitters, I didn't want to layer this over black, I also didn't want to layer it over any other colour that matched the glitters. I ended up deciding on silver. Then I saw my Layla Mirror Effect Black as Ebony sitting there in front of me and I thought it would look so awesome having this shiny mirror finish behind the glitter. Sadly Black as Ebony did not stay mirror like once I put Graffiti over the top, instead it gave it a flat gun metal finish. In the end it actually felt kind of edgy wearing this, like graffiti sprayed of the side of a metal train carriage or something. This is one dabbled coat of Graffiti on Black as Ebony topped with two layers of top coat. I needed to dabble it on to get the shredded glitters to space out as they have a tendency to stick to each other, but as you can see it was easily achieved. 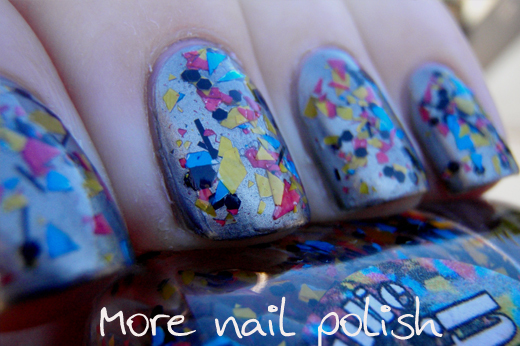 You will also need those two layers of top coat, cause some of the edges of shredded glitter can be a bit pointy. 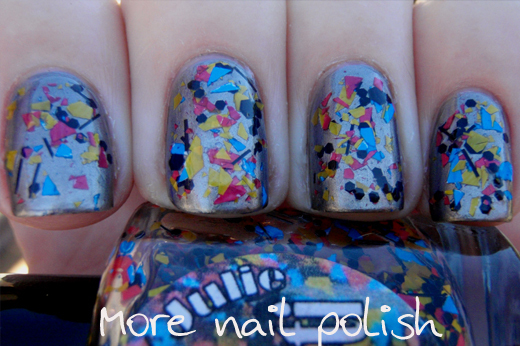 Graffiti is from Sparkles by Julie and is $8.50 for a full sized bottle. Julie is located in Hawaii, but she does ship worldwide. silver layer is so perfect !